If you’ve been reading the blog but aren’t sure what our stream will be like, check out the channel trailer we just made (less than 2 mins). We launch tonight at 9pm EST, till 12 am EST. 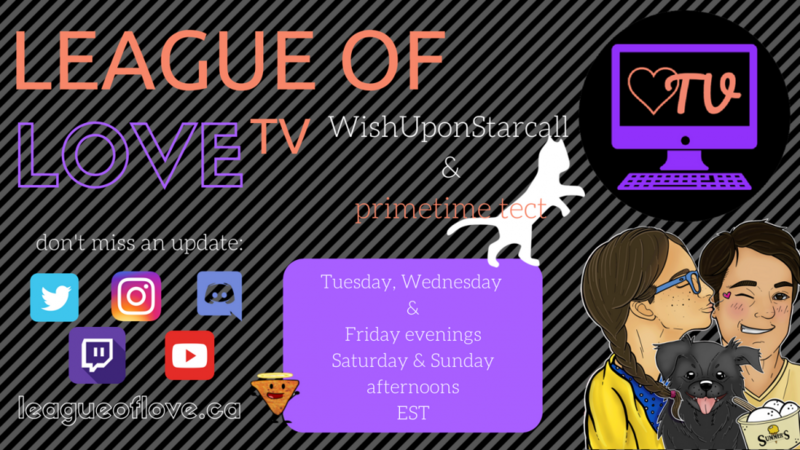 If you can’t make it tonight (as I realize I’m posting this a little a lot late), we… Continue reading League of Love TV Channel Trailer – Launch Happens Tonight! So Many Champions. So Little Time. Last week, some of you were wondering why I didn’t cover some of the other things happening in the League Universe (Arcade, Ornn, etc.) – it was because I got all excited about the Star Guardians and URF and ended up writing a whole bunch about those, and I didn’t want the post to be… Continue reading So Many Champions. So Little Time. Exciting announcement!! We are thrilled to be able to tell you that we will begin streaming regularly on August 30th! Starting then, you can catch us on Twitch on Sundays from 12-3, Wednesdays from 9pm – 12am, and Fridays from 6-9pm (all EST). Don’t worry, you don’t have to memorize that – we have it… Continue reading All My Dreams Are Coming True!